This is my second review of the cigars so graciously offered as winnings in Goldie (Drew's) "get your feet wet contest". The cigar labeled "2" was a large ring gauge torpedo. It had a dark looking wrapper and felt very firm when I pressed it between my fingers. The wrapper had some slightly larger veins. 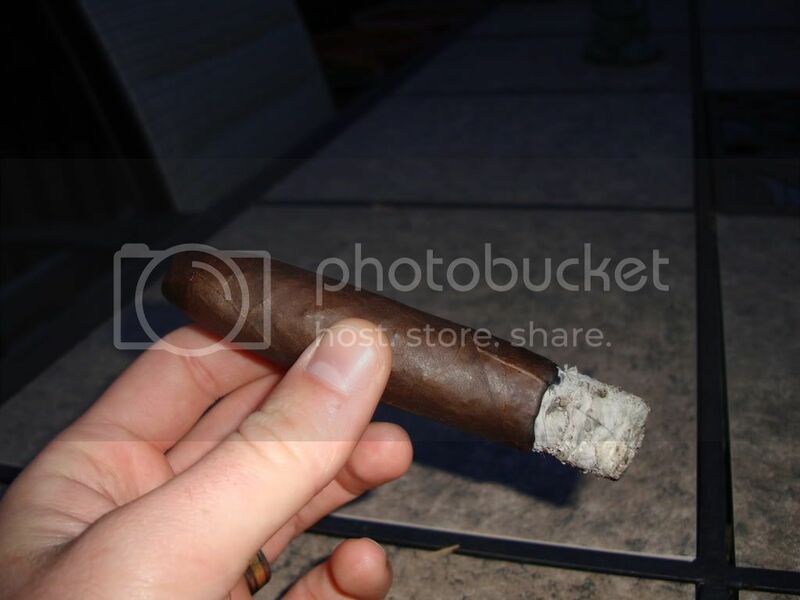 The cigar had a pungent aroma and smelled spicy. I clipped around 1/4" of the end again with the double guillotine cutter that Drew was kind enough to provide with the shipment. I should note that I was excited for this cigar because it was my first ever torpedo. I took a pre-light draw and BAM! I was hit with a peppery taste that struck the back of my palate so hard I actually coughed... really... ask my wife. I could immediately tell that this cigar was going to be a different beast from the La Riqueza. I was pleased, however, to find that the draw had just the right amount of resistance. 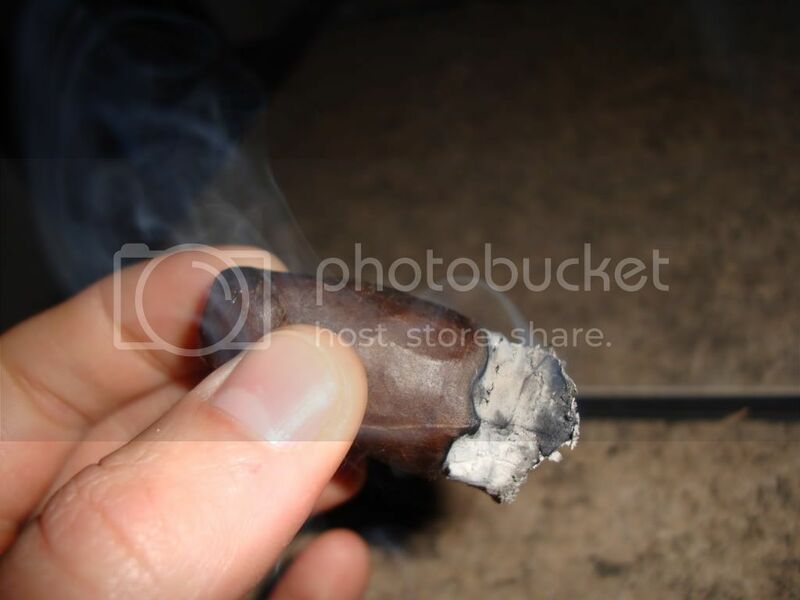 Once lit the cigar began emiting a large quantity of smoke and my first puff confirmed my earlier conclusion. This cigar had a kick to it! Immediately and for the 1st third of the cigar I tasted a woody taste that started out bark like but finished up with a cedar taste as it got going. I could taste pepper and I could feel it on the back sides of my tongue. The burn started very straight and true during the first 1/3rd. 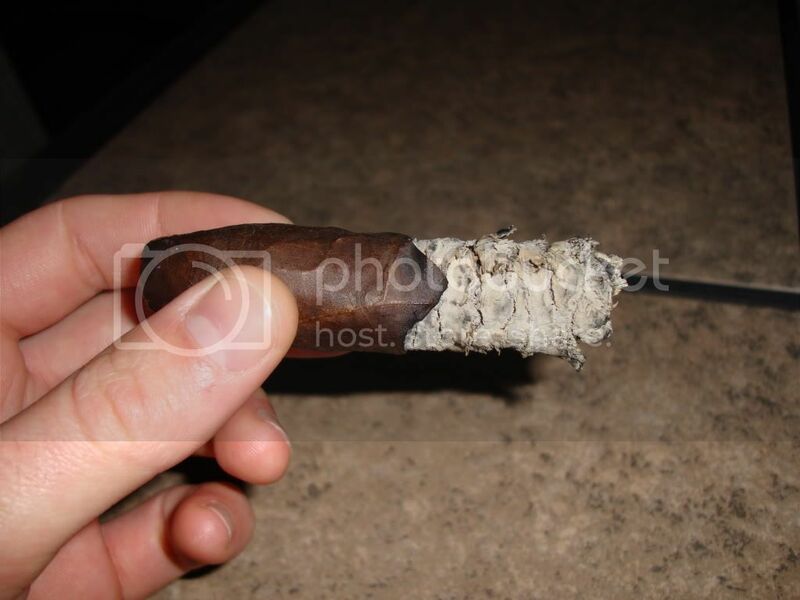 Based on how tightly packed the cigar was I was surprised that the ash was actually pretty loose. It unexpectedly fell off just before the end of the first 1/3rd. The second third of the cigar I began to pick up a more earthy flavor with hints of leather on the back of my palate. I did taste the twinge of pepper throughout the cigar but that seemed to fade more into the background behind the leather as I smoked through the second and final 1/3rd. I think this picture illustrates well how loose the ash was. I did have to relight the cigar about mid way through the second 1/3rd. You can also see in the picture that the burn line became slightly uneven in the second and final 1/3rds. All in all the cigar lasted for 1 hour and 45 minutes. 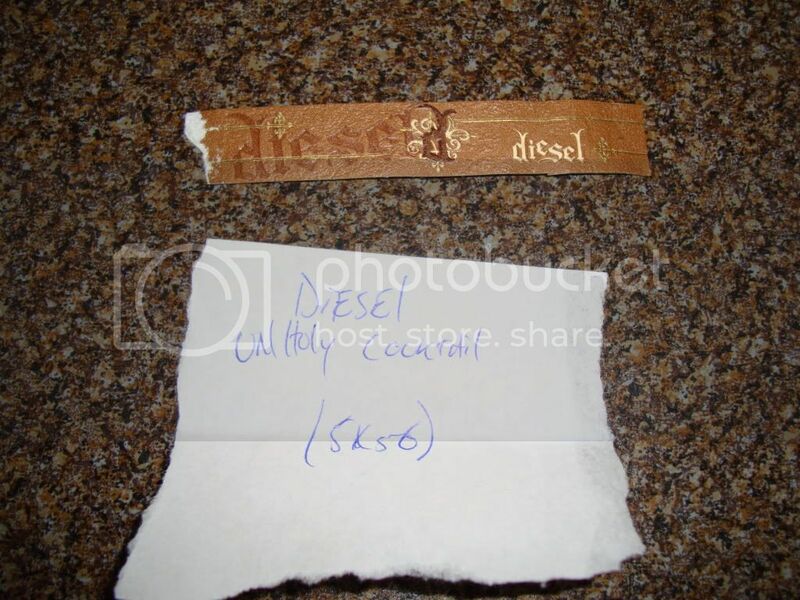 Diesel Unholy Cocktail 5" x 56 ring gauge. Again, I thoroughly enjoyed this cigar. I'm not one to place a number in for a rating as I think my words speak for themselves. 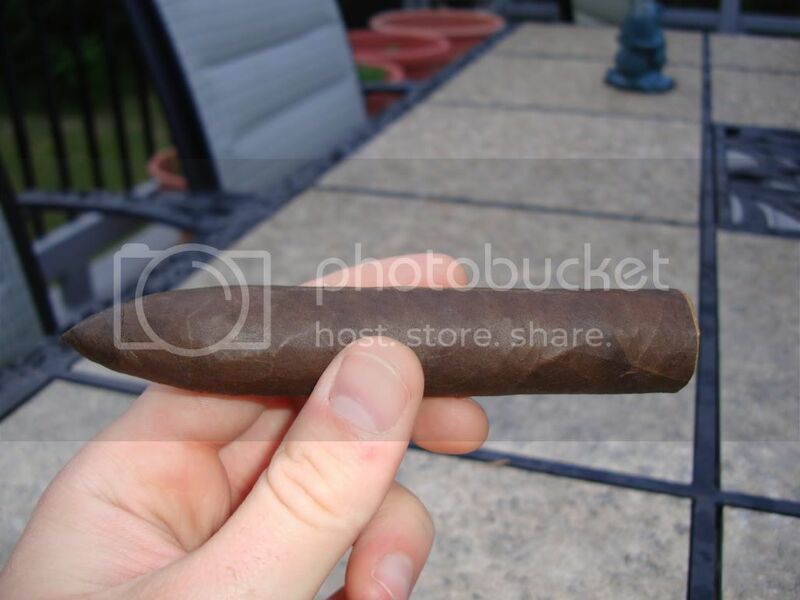 This was my first torpedo shaped cigar and it definitely stood out as a new cigar experience (and that was the whole point of the contest). Thanks again to Goldie (Drew) for the great stick! Nice review. Pretty much sums up my experience with the UC's. Damn fine review of a great stick. Solid review Randy. I'm glad you enjoyed it. I look forward to the rest of the reviews. I've two very different experiences with this cigar...one I hated...absolutely hated. The second time I smoked it I really liked it. I haven't given up on this bad boy yet, so I'll have to give a couple more a shot and see what I get then.